A pair of 15-month intervention programs teaching children with autism spectrum disorder about emotional understanding and social awareness, in close collaboration with parents, teachers and facilitators. Available for two different ability levels. 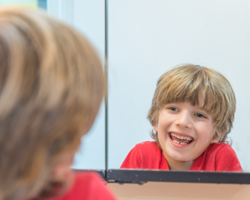 Not just clinic-based, the Westmead Feelings Program develops parents’ and teachers’ emotion coaching skills, supporting children to understand emotions, solve problems and ultimately manage their feelings in everyday settings. Facilitator introduces children to four primary emotions – happy, sad, worried and angry – and explains that there are different intensities of feelings. Children learn this concept with help of the Feelings Strength Bar. Facilitator works closely with parents and teachers to ensure the best possible outcome for each child. Parents and teachers are introduced to their role as ‘emotion coaches’, and learn about how to support children to talk about their emotions. What is the Westmead Feelings Program? Children learn about feelings in themselves and in others, to foster a greater understanding of the causes of and influences on people’s emotional experiences and behaviour. They also learn specifically tailored cognitive-behavioural therapy strategies. Parents and teachers continue to fine-tune their emotion-coaching skills, and learn about problem solving and perspective taking. Children learn a range of strategies for dealing with difficult or unpleasant emotions to feel more in control and accepting of their emotions, enabling them to react more appropriately and in more socially positive ways. Parents and teachers learn ways by which they can support children's emotions management skills. The Boosters comprise one session each for children, teachers and parents approximately six months after completion of Module 3. The Westmead Feelings Program has been proven to significantly improve emotional competence in children with ASD and in children with ASD and mild intellectual disability. Emotion-based learning for children with autism spectrum disorder and mild intellectual disability. Westmead Feelings Program 1 is aimed at verbal children, who may or may not read, can draw simple pictures or write a few key words and can pay attention for at least a few minutes at a time. Emotion-based learning for children with autism spectrum disorder and no accompanying intellectual impairment. Westmead Feelings Program 2 is aimed at children who have fluent speech, and who are able to read and write. 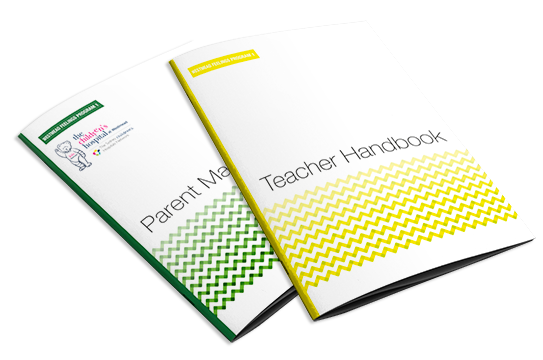 Purchase of WFP Resource Kits is restricted to psychologists, speech therapists, occupational therapists, allied health professionals, special educators, school counsellors and teachers. It is recommended that practitioners complete WFP training to become accredited facilitators before running the program. The Westmead Feelings Program is really useful for children, parents, teachers, psychologists and all other professionals working with children with autism spectrum disorder. It provides structure, helping parents to practice skills and the child to learn in a concrete way, as children with autism spectrum disorder need protocols or structure to understand emotions. The program provides an easily understandable common language around emotions that are colour and number coded for children with autism spectrum disorder. The program deals with the basic four emotions which helps these children in their day-to-day social functioning without making emotions complicated or difficult to learn. The use of videos and visuals help learning and relevant everyday examples of social-emotional situations helps the children to understand and relate better. Finally the Westmead Feelings Program is evidence-based, hence it works to support children with Autism to have an independent, fulfilling and socially integrate life through the development of their social and emotional skills. The Westmead Feelings Program is making an important contribution to the field of autism research and intervention; it is a program that can be adopted by schools, teachers, and families to better support ‘well-being’ curricular strategies in the education of students on the spectrum. Further, the Westmead Feelings Program is helping to address the gap in the literature in relation to students on the spectrum who may also have an intellectual impairment. 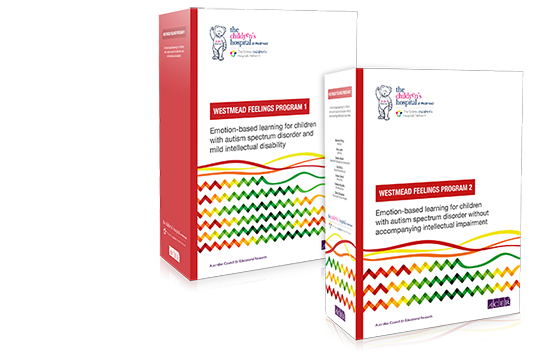 I highly recommend the Westmead Feelings Program to anyone who seeks to improve the emotional competence, mental health and well-being of school-age students on the autism spectrum. The Westmead Feeling Program provides information that directly addresses the difficulties teachers and parents experience on a daily basis with students on the spectrum. Every parent involved in the initial information session identified with the concepts presented and provided examples of how it applied to their child. This provided an excellent opportunity for parents to share their experiences. The session was clearly enjoyed by all and we look forward to the first student sessions. As an added benefit, the program is an all-in-one pre-prepared initiative to which all of the resources and information are at your fingertips. The utilisation of different learning methods and media to teach the concepts also enhance the prospects of the program further. Through video, role-plays, games and modeling the program is fun, unique, relevant and useful. I have no hesitation in recommending this training to any professional wanting to work within an excellent framework to assist students with autism spectrum disorder.